Rare plans to dig into its lengthy development history again for future titles. Rare recently told CVG that the Xbox Live Arcade version of Perfect Dark will be far from the company's last project that involves a past IP. Studio head Mark Betteridge said: "There's nothing to announce yet after Perfect Dark, but we've got over 25 years of IP to dip into so there's no shortage of possibilities." 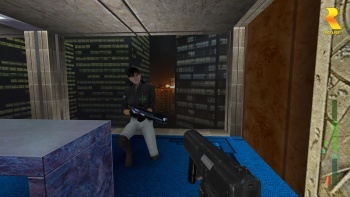 Perfect Dark XBLA could easily be something that whets the Rare-lover's appetite for a suitable time period. Many people tend to talk about 1997's N64 classic GoldenEye as one of Rare's best works (and it is), but for some reason neglect to mention the much improved Perfect Dark which was released in 2000. After playing newer games such as CoD: MewTwo, it might be hard to get into the play-style of Perfect Dark, but it really was retro multiplayer at its best. Betteridge says the XBLA remake — which will include online multiplayer, a boosted framerate, improved textures, and leaderboards — will "be arriving on Xbox Live Arcade in the next few months." After its release, Rare seems to be planning another remake or at least the use of an IP not seen for a while. The questions is: what IP could the company use? It's already gone with the Banjo-Kazooie franchise a few times, so that's likely out. Hints have been dropped that Rare might bring back Battletoads, Jet Force Gemini, Grabbed by the Ghoulies, or Killer Instinct, so those titles spring to the top of the list. Betteridge more recently talked about doing something different if Rare remade Killer Instinct, making the series a best bet for the company's next project. Battletoads and Killer Instinct would be awesome franchises to revisit, but there's one in particular that really needs to come back: Conker. Conker's Bad Fur Day (which was updated on the original Xbox) was a direct response to all the cutesy 3D platformers of the N64's day, bringing a drunken squirrel into the mix that fought a giant mountain of poop. Do videogames get any better than that?